Ultra dapper and confident it’ll capture your attention, this sofa is out to pursue your interest. 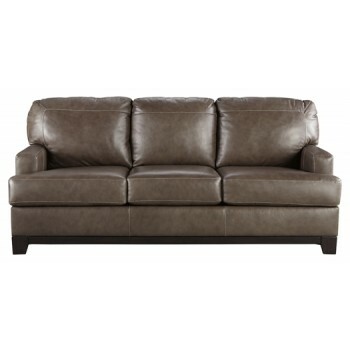 Two-tone pewter color effect adds depth and character to the 100% leather seating area. Window pane stitching on the back cushions invites you to look into all that Derwood has to offer. Set-back track arms and dark exposed frame set this sofa apart. Supple upholstery makes it easy to take a seat. You’ll be lost in its swagger in no time.